which runs parallel to Peachtree Blvd just to the North. 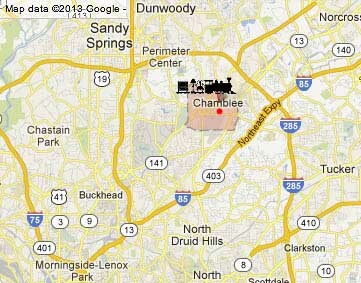 We are located on Antique Row in Chamblee, across the street from the Chamblee City Hall. We are walking distance just north of the Chamblee MARTA Station on Peachtree Road. From Atlanta: Drive north on I-85 to I-285 West (Perimeter); exit west and proceed to Peachtree Industrial Blvd. South exit #31A; go 1.5 miles to Broad Street; turn left and proceed to Chamblee’s Antique Row. From Lenox Square: drive north approximately 3.5 miles on Peachtree Road. Turn right gas station on the right traffic light (you’ll see Lowe’s on your left) and continue on Peachtree Road to Chamblee’s Antique Row. Saturday 10am-5pm and Sunday 1-4pm.